Concurrent Technologies Corporation (CTC) and key partners provide viable solutions to optimize critical logistics, supply chain management, and readiness operations. We capably analyze, identify, and develop enabling technologies to accelerate integrated logistics support, enterprise integration, and customized decision-support tools at all levels. CTC’s solutions are providing actionable information for total life cycle management and enabling critical decision-making capabilities for U.S. warfighters. 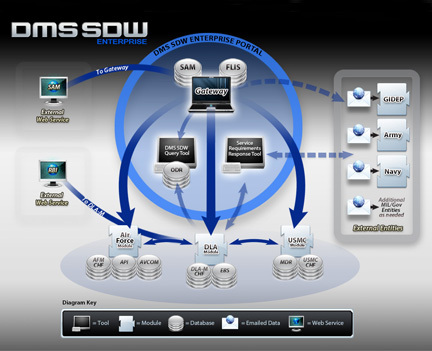 Beginning in 1997, CTC designed and developed the Diminishing Manufacturing Sources Shared Data Warehouse (DMS SDW) to improve the sustainability of DoD weapon systems by reducing the impact of Diminishing Manufacturing Sources and Material Shortages through more effective identification and management of materiel obsolescence issues. The DMS SDW was developed for the Defense Logistics Agency (DLA) and adopted for use by the military Services and various DoD activities. It is recognized as one of the key tools enabling the identification and management of obsolescence and has become the backbone for an integrated parts management environment. CTC developed the Total Life Cycle Systems Management (TLCSM) ExtendSim Logistics Analyzer (TESLA) Discrete Event Simulation tool to enable rapid prototyping of life cycle sustainment models, providing both a strong foundation and the flexibility to adapt the model to many specific questions regarding reliability, availability, maintainability, and cost metrics. This simulation provides decision makers with insight into the implications associated with different operational, supply chain management, and business case decisions. 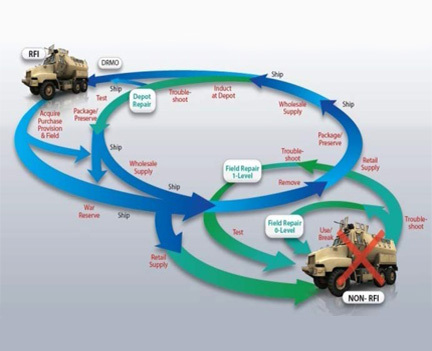 Initially implemented to support decisions as they relate to the MRAP vehicle fleet throughout the remainder of its life cycle, the tool was extended to additional analyses including business case analyses. Modular design and automated data import features enable rapid and flexible analysis of TLCSM issues for a multitude of Army and Marine Corps acquisition programs throughout their life cycles. The award-winning Marine Corps Equipment Readiness Information Tool (MERIT) is the first of its kind Equipment Readiness management tool developed by capitalizing on existing Marine Corps efforts. 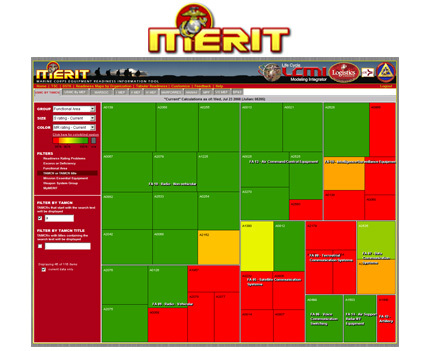 MERIT is a powerful, web-enabled tool which graphically depicts the current readiness posture and detailed supply and maintenance information for all Marine Corps weapons systems. Versatile, scalable, and intuitive, MERIT taps into a repository containing historical weapons systems data and current daily logistics data output from Marine Corps Systems. TLCM-COP is a module within the Marine Corps Equipment Readiness Information Tool (MERIT). 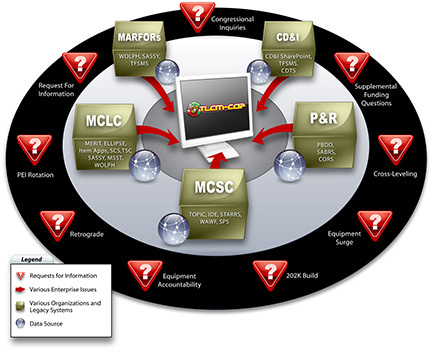 TLCM-COP enables Marine Corps personnel to view the status of weapon systems and equipment through the entire life cycle process—from requirements determination, to acquisition management, to funding, to fielding to the operating forces, to sustainment, and ultimately, to disposal. TLCM-COP enables USMC senior leadership to make decisions efficiently and effectively, utilizing the same data as program managers and the fleet. It minimizes the need to reach out to several different organizations and de-conflict request for information results. TLCM-COP uses the same business rules and metrics to measure key total life cycle management processes for all equipment so information does not have to be gathered, analyzed, put into the same context, and assembled for presentation.